Yesterday, I was surprised with the most wonderful package on my doorstep– a “Happy First Mother’s Day” gift from the most wonderful Aunt a girl could ask for. For some reason, it hadn’t hit me that this will be my first TRUE Mother’s Day. I feel like I’ve been Grae’s Mommy for as long as I’ve been alive myself. I simply cannot imagine a time when he wasn’t a part of our lives. Last year at this time, I was 3 months pregnant and we had our three foster daughters living with us. Wow. Just one year later and so much has changed. 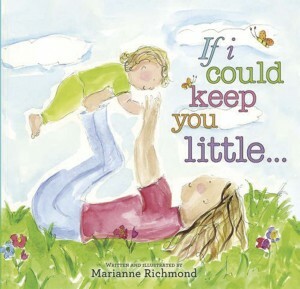 In addition to a beautiful card and a DELICIOUS recipe book (that I can’t wait to try every single recipe out of), the package included a children’s book called “If I Could Keep You Little.” It’s a beautiful story about growing up. I have really been an emotional basket case struggling at how fast my perfect, helpless baby boy is turning into this sweet, funny little boy with a personality and opinions all of his own. This story helped me see that if I could stop time, and keep him as a baby forever, like I’ve wished a million times, I would miss out on so many equally amazing things. I couldn’t even get through it the first time I attempted to read it to G. Late last night, I started reading it to him again, and by the end, my voice was cracking and big tears were streaming down my cheeks. It really is the most beautiful story and I will cherish it forever.